The Yankees are onto the ALCS! The Yankees are onto the ALCS! I’m still in shock. Happy shock. I got about 20 seconds of sleep from being so amped up by the time I turned off the TV last night! CC was tremendous. D-Rob was tremendous. Chapman was tremendous. And that’s just the pitching. Didi’s two homers not only chased Kluber ultimately but gave CC and the rest of us some room to breathe. With an early lead, the Yankees at least had a chance. But the key for me was, of course, that Herculean at-bat by Gardner, fouling off pitch after pitch with two on base, ultimately knocking in those runs. Wow. Just wow. I could spread the kudos around to everybody – all the Yankees contributed during this series. But I was just so happy for them when it was over. They fought and fought during each elimination game and came through. So resilient. Especially Chapman. I thought his arm would fall off, but no. He was sensational. Will he have any gas in the tank for Houston? I’ll worry about that tomorrow. Was I surprised that the vaunted Indians didn’t perform better? You bet. They were the team to beat, but they had so many errors. I’m sure they’ll be brooding about those missed opportunities during the off-season. They’re a great team that just didn’t get it done. Of course, I do take credit for all of this. I ate my lucky club sandwich before each and every win, and I’m so sick of them I want to hurl. But hey, a fan has to do what a fan has to do and I’ll be choking back another on Friday night. Oh – one thing: a plea to Girardi. PLEASE drop Judge down in the order to, like, 7th. I love Judge, but the strikeouts are ridiculous. Until someone teaches him how to hit a curveball, move him down in the order. In the same way that the Yankees played well against the AL West division-leading Rangers, they played well against the AL Central division-leading Indians. And they did it in dramatic fashion, especially on Saturday night in extra innings. Great series and a great way to end the first half of the season. With the All-Star Break upon us now, the question becomes what will the second half bring? No idea. Maybe Evo is better suited to the bullpen. And maybe McCann’s offense really has come around. And maybe Didi, errors aside, is just the offensive spark plug we need. I still think one of the top relievers will be traded for a starter and/or power-hitting right fielder. We could use a good hitter at third base too (sorry Headley). What’s unclear is if Hal wants to stand pat or really try to make a run for the postseason. We know what his dad would do, but his motives have never been as transparent. Meanwhile, it’ll be nice to have a break. I don’t watch the Home Run Derby; Chris Berman’s “back back back” is enough to drive me insane. I don’t have much interest in the All-Star game either. But I do want to wish the new Mr. and Mrs. Jeter a very heartfelt congratulations. I hope they’ll be very happy even though they neglected to invite me to the wedding. Yes, there was a four-game series in Cleveland and yes, the Yankees won two and lost two (in especially depressing fashion – the losses, I mean), but the big news as the team heads down to Baltimore was obviously Tanaka and his “small tear” in the elbow. After consulting a phalanx of doctors, Tanaka was told that the prescribed treatment was rehab. If that doesn’t work then he’ll likely go under the knife for good old TJ surgery. Hard to believe, isn’t it? One day he’s our ace. The next he’s in the infirmary with the other members of the starting staff who were supposed to lift us to a championship in Jeter’s final season. Bah. Nothing’s going according to plan. And then there was Beltran. No, that’s not actually his face, but the point is he fractured it in two places all by himself. Freak accident indeed. All I could do was sigh about that one. Will the weekend series against the O’s be a massacre of our young lambs and creaky veterans or will we scrape together a win or two? On the plus side – and there’s always a plus side – I didn’t expect to see the run production we’re getting out of Teixeira this year after coming off his various injuries. And Gardner and Ellsbury have been a revelation. It’s not the stuff of championships but it’s something. A complete game performance by the big man and homers from Hafner and Gardner seem to have done the job to finish the series with a sweep. I didn’t watch – it was a work day – but I enjoyed keeping up with the game score and summary. Now the Yankees are off to my part of the world and while I know the east coasters reading this groan at the late hour of the games during these west coast swings, I couldn’t be happier. I get a full day’s work in and then watch the boys while I’m having dinner. I just hope they don’t ruin my appetite by letting the Mariners beat them, Raul Ibanez in particular. Two homers in two days. I like it. Is Teixeira back for good? Sure looks like it. The other nice bounceback in tonight’s win over the Indians was Phelps. After that last outing, I was worried that he might not be able to put his awfulness behind him, but that’s exactly what he did. We need him, so a big Whew. I did hope the Yankees would score in the late innings to give the relievers some breathing room, but they seem to have run out of gas offensively, especially Cano, who was up in an important spot and couldn’t deliver. I wonder if he was distracted by the Biogenesis stuff, but more on that in a sec. I couldn’t believe what jinxes Michael Kay and Al Leiter were. They were going on and on about how great Joba looked and then – bam – three-run homer. Maybe they should button it next time. OK. Biogenesis. The ESPN report. A-Rod. Cervelli. Etc. Yes, it’s explosive stuff. And yes, even Cano was ensnared in the whole business for awhile today until sources told the Yankees he was off the hook. And yes, the suspensions would be the most punitive in sports. But here’s the thing: A-Rod denies involvement with the clinic so the whole case could come down to a he-said/he-said situation pitting him against Bosch. Which sounds all too familiar (Clemens/McNamee). Ugliness for baseball all around. I know. Tonight’s big hero was Tex, and I formally apologize for saying he wasn’t helping the Yankees. His grand slam off Masterson was a thing of beauty and gave us an early boost against the Indians. But watching closeups of Overbay in right field smiling when the Bleacher Creatures did his roll call and the fans out there cheered for him and running hard toward the wall for a foul ball and then making the catch on his first chance ever as an outfielder….Well, it was priceless. He even had a hit. He’s such a mensch and I hope the Yankees find a way to keep him around for awhile. Andy didn’t look so dandy after the first few innings. He kind of petered out early. But the pen was mostly good, so no harm done – unless he tweaked something again, of course. A nice, nice win for the boys in this series opener. I loved seeing them laugh and high-five in the dugout after Mo got the save. It was as if all the losing never happened. 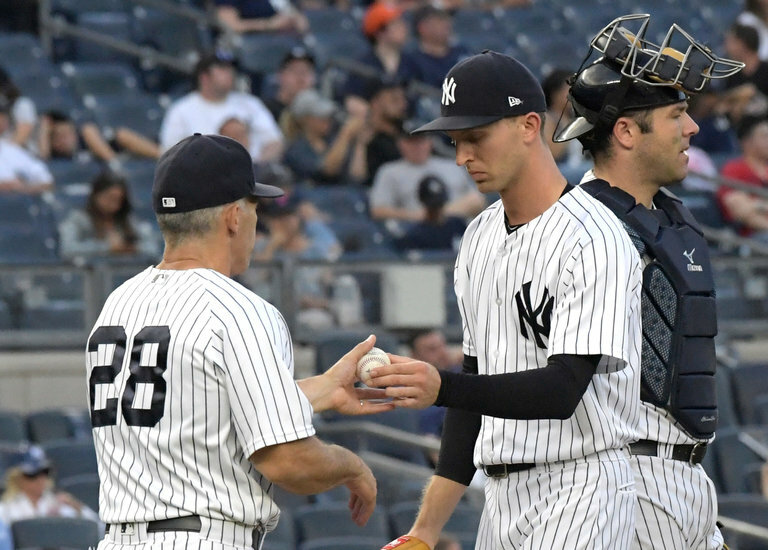 It was quite a day for the next generation of Yankee players – AKA the Scranton team – as several of them got the call to help out with the doubleheader in Cleveland. While the Yanks did lose the opener in a shutout, Phelps pitched very well, minus his walks. It was in the second game that the Baby Bombers really did their thing. Vidal Nuno and Adam Warren, two pitchers who’d been impressive in spring training, were impressive today, shutting out an Indians team that had been red hot. And how about emergency infielder Corbin Joseph getting his first major league hit and Austin Romine getting in on the offensive action too. And then there were the usual heroics from Wells, Nix and Overbay (I still can’t believe it every time I type their names). I don’t know what magic pixie dust Girardi is sprinkling in their Gatorade, but it’s working. The YES guys were talking about Granderson coming back and I’m glad, I really am, but I like the chemistry of this group right now. I don’t want the big stars screwing it up! Now if I can just stop calling Austin Romine “Austin Romaine” and Vidal Nuno “Vidal Nunez,” that would be nice. P.S. Just wanted to post this pic sent to me by Yankee Fan and FOB Cesare (he reads but doesn’t comment). I got a kick out of it. And Vernon Wells. Are there enough superlatives for him right now? The man has been positively resurrected from the dead. Tomorrow’s doubleheader in Cleveland should be interesting since the roster’s so thin and Nova isn’t healthy enough to pitch (what’s up with that?). I just hope they get through it in one piece. Another, Even Better Janer. Seriously! And we all said the Yankees would have trouble scoring runs this season. Ha. Of course, they weren’t exactly facing the best pitchers in the majors tonight against Cleveland, but if hitting is contagious the Yankees have all caught the bug. What fun! First there was small ball and then there was big ball and then there was just a lot of offense, period. And Andy. Wow. There aren’t enough superlatives for him. He continues to deliver just the way he always has, and I hope he never retires. My problem with this game was Carrasco, the Indians starter. The guy has a history of being a head hunter, sort of a younger Padilla, and I was completely in agreement with the ump who ejected him for hitting Youkilis. Francona argued and I get that, but Carrasco is just back from serving a suspension for the same offense. There’s no place in the sport for punks like him and I was grateful that he was gone – especially when the Yanks were able to feast on Myers. Back to the good stuff, it was great to see Gardner, in particular, hit the ball so well. We need him to be productive at the top of the order, and that’s what he was tonight.